Taxes an Obama Nightmare: Geithner’s, Daschle’s, Now More…. Labor Secretary-designate Hilda L. Solis on Thursday became the fourth senior administration nominee in a month to see their Senate confirmation slowed or scuttled over problems with their taxes. A Senate committee abruptly canceled a confirmation vote on Ms. Solis after news reports that her husband, Sam Sayyad, had 15 outstanding state and county tax liens placed on his Los Angeles auto repair shop. The White House said that Mr. Sayyad and his wife were unaware of the liens and that Mr. Sayyad had paid the county $6,400 on Wednesday to settle the debt. However, the revelation compounded the political damage done by the failed nominations of former Sen. Tom Daschle to be secretary of health and human services and of Nancy Killefer to be “chief performance officer” in the White House budget office, both because of tax problems. Treasury Secretary Timothy Geithner was belatedly confirmed last month after contentious hearings prompted by revelations that he had failed to pay self-employment taxes while working for the International Monetary Fund. The problems are not limited to Obama appointees. Al Franken, whose narrow election as senator from Minnesota is being challenged in court by Republican Norm Coleman, was slapped with $25,000 in penalties for failing to pay workers’ compensation for the company he established in New York. He also had to pay $70,000 in back taxes and penalties to 17 states, where he earned income between 2003 and 2006. Mr. Franken has claimed that he paid taxes on all of his income to Minnesota and New York, where he lived. He said he is due tax refunds of $50,000 from those states. The spate of tax problems, recalling similar issues with nominees in the past two administrations, has raised questions whether the U.S. tax code is so complex that even Washington insiders and their highly paid accountants cannot navigate the rules. “There were no other names,” said one administration ally who was not permitted to speak on the record about the Daschle saga. 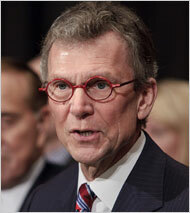 Yesterday, Daschle withdrew his name after acknowledging he paid $146,000 in back taxes and interest. Now Obama must forge ahead without his close friend and Washington mentor, a setback that health experts across the political spectrum described yesterday as serious but not insurmountable. The embarrassing departure of any Cabinet choice complicates the work of the White House. But the announcement yesterday that Daschle was withdrawing his nomination and also resigning from the health czar job created especially for him was a particularly damaging blow to the new administration. When Obama named him in mid-December, Daschle seemed the “ideal choice,” in the words of Sen. Edward M. Kennedy (D-Mass.). “Exceptionally well-qualified to bring people together,” insurers proclaimed. Official Washington said Obama had demonstrated that he possessed the commitment and smarts to tap a savvy insider to achieve something the Clintons could not. Two of President Barack Obama’s top nominees withdrew their named from consideration today because of tax irregularities. Tom Daschle, the nominee as Secretary of HHS, and Nancy Killefer, who President Obama named to be the nation’s first chief performance officer, have both said they, in the past, failed to pay their taexes in full. The current Treasury Secretary Tim Geithner also had that problem but his nomination was confirmed by the senate. In the senate today, the president’s economic stimulus plan is being debated. The White House invited several national journalists to interview President Obama today on the stimulus but questions about ethics are also expected…. Despite the tax problems faced by high-level nominees, and the exceptions made to the no-lobbyists pledge, President Barack Obama’s spokesman is defending the administration’s ethical standards. During a briefing filled with questions about Tom Daschle’s decision to withdraw from consideration to be Health and Human Services secretary, Gibbs pointed to experts who describe the administration’s ethics rules as the strongest in history. He also said those experts recognized that Obama would need to make exceptions to his pledge to run an administration free of former lobbyists. Obama’s choice to become the No. 2 official at the Defense Department recently lobbied for military contractor Raytheon. And his choice as deputy secretary at Health and Human Services, lobbied through most of last year as an anti-tobacco advocate. Tom Daschle has withdrawn his name from consideration as President Barack Obama’s nominee as Secretary of Housing and Human Sevices. This is a setback for the president and the administration that has vowed to have the most ethical government ever…. Tom Daschle apologized for making mistakes on his tax records. Earlier today the president’s nominee to be the first chief performance officer for the federal government, Nancy Killefer, who failed for a year and a half to pay employment taxes on household help, withdrew her candidacy. “Tim Geitner got a pass for not paying his taxes,” Chris Wallace of Fox News said, “but a lot of people now have serious concerns” about Tom Daschle, the president’s nominee as HHS Secretary. Geithner is now Treasury Secretary. Tom Daschle withdrew his nomination on Tuesday to be President Barack Obama‘s Health and Human Services secretary, faced with problems over back taxes and potential conflicts of interest. “Now we must move forward,” Obama said in a written statement accepting Daschle’s request to be taken out of consideration. A day earlier, Obama had said he “absolutely” stood by Daschle. His stunning statement came less than three hours after another Obama nominee also withdrew from consideration, and also over tax problems. Nancy Killefer, nominated by Obama to be the government’s first chief performance officer, said she didn’t want her bungling of payroll taxes on her household help to be a distraction. Obama, Vice President Joe Biden and Daschle’s former Democratic colleagues had rallied to his defense in the wake of questions about a series of tax issues. Last month, Daschle paid $128,203 in back taxes and $11,964 in interest. 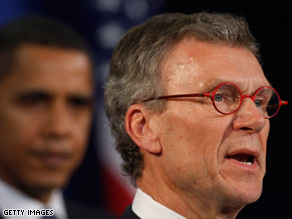 The withdrawal comes after Republicans and major newspapers questioned Obama’s decision to stick with Daschle. Republican Sen. Jim DeMint of South Carolina said Obama was “losing credibility” with his statements in support of Daschle. “Part of leadership is recognizing when there has been a mistake made and responding quickly,” the Republican said. In an editorial, The New York Times described Daschle’s ability to move “cozily between government and industry” as a cloud over any role he might play in changing the nation’s health care system. When the New York Times tells a liberal Democrat he is no longer wanted, people listen. When a man’s former colleagues in the “clubby” U.S. Senate tell him to withdraw from a top government job for ethical concerns, well, he is past saving…. Republican Sen. Jim DeMint on Tuesday called for President Obama to withdraw the nomination of Tom Daschle for health and human services secretary, becoming the first senator to say that the former majority leader’s tax problems are disqualifying. DeMint told FOX News that Daschle’s failure to pay $134,000 in federal taxes reflects a “problem with integrity” that the government cannot afford to tolerate. DeMint spoke out against Daschle as a number of prominent newspapers, including The New York Times, called for the South Dakota Democrat to drop his bid. “It’s very unfortunate with Tom Daschle that this has occurred, but the president needs to lead. He needs to step in here and he needs to withdraw this nomination,” the South Carolina Republican said. DeMint said he came to that conclusion after it became “obvious” that Daschle knew about the tax problems long before his nomination and did nothing to make it right. “The average American would likely face criminal charges with tax evasion of this size, yet he did not address the issue until he was nominated,” he said. You are currently browsing the archives for the HHS category.